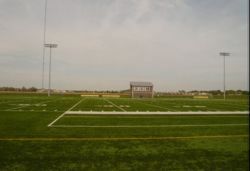 The newest sports complex in Altoona is located on the south side of the town. Spring Creek Sports Complex, home to Altoona Youth Soccer Association! You will find youth of all ages and skill levels practicing and competing in games during both the spring and fall. Thirty-six fields, a concession stand and playground can be found on the site. And its a busy place! Located on the eastern side of Altoona, the complex is bordered by a trail, so its easily accessible by car or on foot! Overall, its a very nice facility with some talented athletes playing on the field. A great way to spend a Sunday afternoon!